Be Inspired This World Fairtrade Day! “During Fairtrade Fortnight and every child at Horbury Bridge Academy had lessons based around Fairtrade. 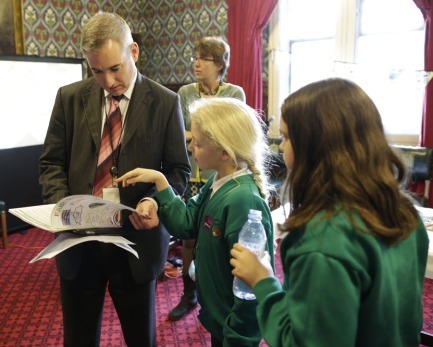 An invitation to a workshop in the Houses of Parliament from fairandfunky spurred us onto creating a magazine recording all our Fairtrade work – this we planned to distribute to all we met in London. 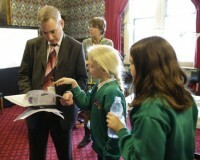 The workshop was informative and creative – the children made flags and were encouraged to spread the Fairtrade word! Our children certainly did as Sophie and Helen asked, walking along the streets of London waving their newly made flags and shouting “Stick with Foncho – Buy Fairtrade”. The combination of work in school and this fairandfunky trip has given our children a very solid knowledge and belief in the benefits of Fairtrade. At a question and answer session with Wakefield MP, Mary Creagh they asked her to circulate copies to her colleagues and the school has since been thrilled to receive letters from her and four other MPs congratulating them on their Fairtrade work. Do you think learning about justice, fairness and Fairtrade worthwhile? Rachael: Yes, because now we know how we can support poor farmers. Holly: Definitely, with the education we’ve now got we can pass it onto our own children in the future. Tommy: It’s cool because it only takes a lit bit of our time to learn but we can make a big difference with the knowledge. What do you think about our magazine and what impact do you think it had? Rachael: It was a good way to inform others about Fairtrade because it was very colourful. We put a lot of effort into Fairtrade and I feel happy and proud that lots of people have been able to read about our work. Tommy: It’s great that it wasn’t just kept in school but people elsewhere found out about what we are doing here- reaching people we don’t know. Holly: When we were in London we were handing it out to people in the street, loads of people took a copy. The magazine was done in a fun way because it had games and puzzles and not just loads of writing. What are your thoughts about MPs reading our magazine? Rachael: It’s good that they have read it and that they are supporting Fairtrade. They are taking on board that there is something bad about this world and things are unfair. Tommy: They are a lot more powerful than us so they can make a bigger difference. Holly: Hopefully having read our work they will pass on the message about Fairtrade’s good work at their meetings and that will change things. Who do you think can make a bigger difference? Holly: Everyone can help. At the moment Fairtrade prices are slightly higher than other things but if everyone bought the products then maybe prices would come down a bit. Managers of shops think too much of how cheaply they can buy things and how much money they can make, rather than that they ought to think how cheap prices affect others.